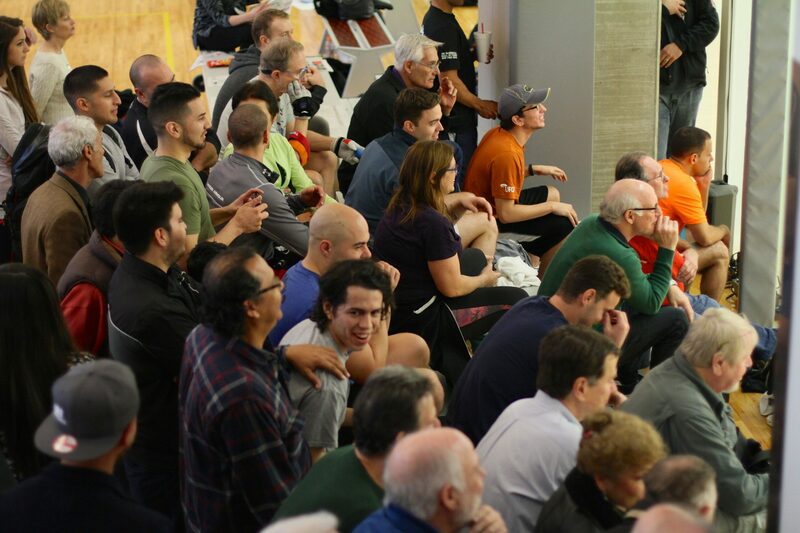 Play kicked off on Friday morning at Houston’s Tellepsen YMCA with a full qualifier draw with many of the best player’s in the country vying for one of the eight coveted spots in the Houston R48 field. The R48 pros kicked off their 2015 campaigns later on Friday afternoon, and the Seniors were also in action later on Friday night. 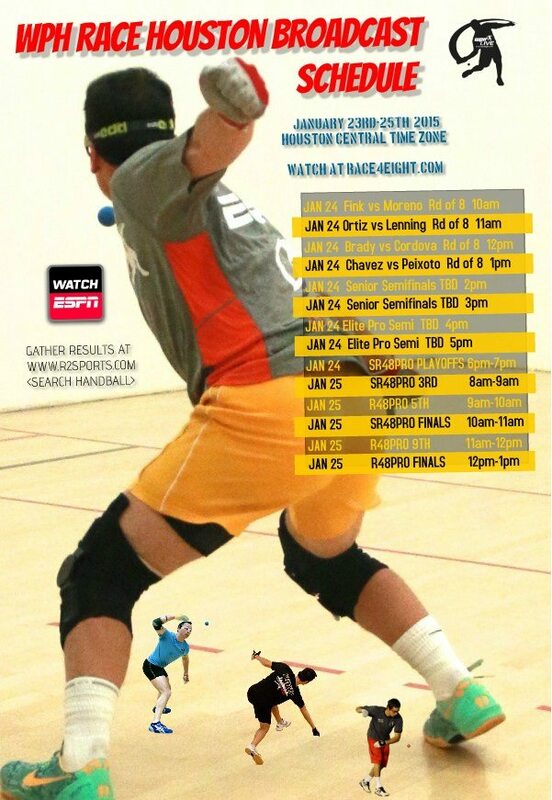 Houston’s R48 qualifier featured one of the deepest fields in the history of the Race, with 30 top players from Mexico, the U.S., and Ireland. Daniel Cordova qualified for the second consecutive R48 event with a dominating win over Erik Torres, Luis Cordova defeated Marco Lemus, Anthony Selestow defeated Bear Meiring, Shorty Ruiz defeated Bill Mehilos, Vic Perez defeated Scottie Moler, Stephen Cooney defeated Adam Berliner, and Jon Iglesias defeated Memo Pallares. The encore qualifier match featured former Houston resident and current top 25 WPH R48 pro Adam Bernhard facing former pro qualifier Dave Munson. Munson electrified the partisan Bernhard galley, hitting deep-court bottom board rollouts with both hands to lead throughout the one game match. Bernhard stayed within striking distance by slowing down Munson’s offense with perfectly placed ceiling shots and lobs, but Munson maintained the lead throughout the one game to 25 final. Munson led 24-20, standing just one point from joining the main draw. Bernhard earned a side out and scored four consecutive points to force overtime. Munson and Bernhard traded points to 26, setting a new overtime record for points scored in a qualifier match. Bernhard completed his improbable comeback, winning 28-26 on a deep court Munson error. Top seeded Paul Brady faced Luis Cordova for the second time this season, and for the second consecutive time, Brady swept Cordova in two games, 15-3, 15-6. Nine-time R48 champion Luis Moreno faced long-time rival Shorty Ruiz and outlasted his contemporary in two close games, 15-11, 15-12. Third seeded and “Brady-slayer” Mando Ortiz started slowly against Stephen Cooney, dropping game one 15-12. Ortiz completely dominated game two in just eight minutes, forcing a third game, 15-2. Ortiz rode his momentum in the tiebreaker, eliminating the Irishman, 12-15, 15-2, 15-7. Fourth seeded Emmett Peixoto needed a tiebreaker to defeat his good friend Jonathan Iglesias, overcoming a second game loss to dominate the tiebreaker. David Fink jumped out to a huge lead on Anthony Selestow in the first frame, but needed a late second-game comeback to defeat “The Heartthrob,” 15-3, 15-8. Daniel Cordova and Abe Montijo staged the longest match of the session, battling for one hour and 50 minutes over three games. Cordova had an opportunity to end the match in the second game, leading 15-9, 14-13, but could not convert. Montijo forced overtime with incredible retrieves and timely kills, but Cordova was fresher and more confident in the tiebreaker, earning his first R48 quarterfinal appearance, 15-9, 14-16, 15-7. Marcos Chavez dominated Adam Bernhard in just 19 minutes, allowing the Harvard man only two points in two games. Sean Lenning started quickly against Vic Perez, dominating game one and leading 12-4 in game two when Perez caught fire. Perez scored the final 11 points of game two to stun Lenning. Perez grabbed a 5-1 lead in the tiebreaker, but Lenning regrouped, scoring 14 of the next 15 points of the match to avoid what would have been his third consecutive first round exit in Houston.